JAM 2017 –Indian Institute of Technology Delhi (IIT D) will be conducting Joint admission test for M.Sc (JAM) 2017 on February 12, 2017 (Sunday) in online mode for admissions to integrated post graduate programmes in science across Indian Institute of Science (IISc) Bangalore and IITs, for the academic session 2017-18. Candidates can apply for the joint admission test from September 5, 2016 in online mode. Check below for the official notification of JAM 2017. Am I eligible for JAM 2017? Candidates who have secured minimum marks of 55% in aggregate of the subjects are eligible to apply for JAM 2017. The minimum aggregate marks, however, for SC/ST/PwD category candidates is 50%. The participating institutes of JAM 2017 will be deciding the equivalent marks at par the percentage for those candidates who have their qualifying marks in grades/CGPA, instead of marks in percentage. IIT Delhi, the organising committee for JAM (Joint Admission Test for M.Sc programmes) 2017 will be inviting online application forms from September 1, 2016. Candidates will have to fill and submit the application form of JAM 2017 including payment of application fees by October 4, 2016. The application fee of JAM 2017 for General/OBC candidates is Rs. 1500, if applying for one paper and Rs. 2100 for two test papers, while that for Female/SC/ST/PwD categories is Rs. 750 and Rs. 1050, respectively. 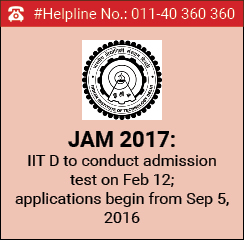 The joint admission test for M.Sc programmes, this year, will be conducted by IIT Delhi on February 12, 2017 in online mode. The admission test will be conducted for as many as seven papers, namely Biological Sciences (BL), Biotechnology (BT), Chemistry (CY), Geology (GG), Mathematics (MA), Mathematical Statistics (MS) and Physics (PH) in a total of two sessions, each of three hours duration. The first session will begin at 9:00 am and the second session at 2:00 pm. As per the official notification of JAM 2017, a candidate can appear for either one or two test papers, subjected to time schedule restrictions. JAM 2017 will be held at as many 64 test centres across the country. Zone-wise institutes are the basis for deciding the exam cities of JAM 2017, where IIT Delhi has the right to add or drop any city from the list of JAM 2017 exam centres. Some of the examination centres of JAM 2017 are Bengaluru, Hyderabad and Kozhikode from IISc Bangalore region, Ahmedabad, Goa, Mumbai, Pune and Vadodra for IIT Bombay region, IIT Delhi zone includes cities like Faridabad, Ghaziabad, Grater Noida, Hisar, Indore and Jammu, (IIT Guwahati) Asansol, Dhanbad, Jorhat, Patna and Siliguri, (IIT Kanpur) Agra, Allahabad, Bareilly, Lucknow and Varanasi, (IIT Kharagpur) Bhubaneswar, Kokata, Ranchi and Vijaywada, (IIT Madras) Chennai, Ernakulum, Madurai, Tiruchirapalli and Warangal, and Dehradun, Kurukshetra, NOIDA, Moradabad from IIT Roorkee zone. Joint admission test for M.Sc programmes (JAM) offers admissions to integrated Ph.D degree programmes at Indian Institute of Science (IISc) Bangalore and M.Sc degree programmes across Indian Institutes of Technology (IITs).